It’s time for some summer stitching fun - a late summer mystery! We are going to create our own garden path. Gather your florals, the green grass of summer, yellow sunshine and add a bright blue sky! This will make a nice lap size quilt approximately 64 X 85 with the borders. Or 56 X 77 without the borders. We used Fat Quarters for all. Make it scrappy! And yes, I had to go find florals. My stash is flower poor – so I discovered. I always pick up extra fabric. Better to have a little extra! Well, Folks – It is hard to measure scrappy!! These are approximate amounts. 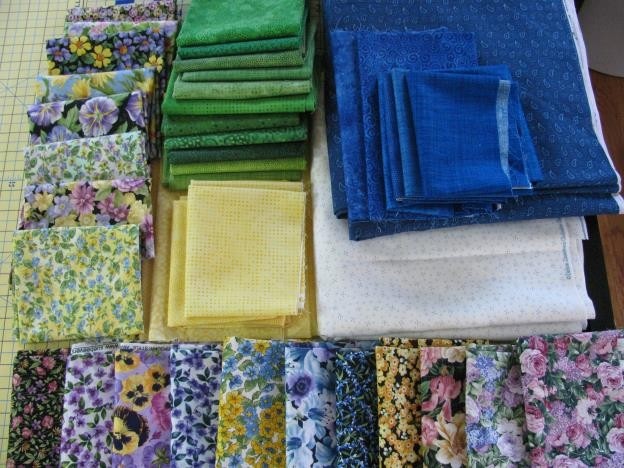 Florals – enough to make 2 1/2 yds. I picked up fat quarter florals on a shop hop. Variety! Green Grass – enough greens to make 2 yds. Yellow Sunshine – enough yellows to make 2 yds. Bright Sky Blue – enough blues to make 1 1/2 yd. White – I used white with a little dot of blue. Can be solid white. 1 1/2 yd. We will add a smaller border to frame our quilt. Framing Border - 1/2 yd. I used my white. Border – 1 yd. I used one of my blues. Throughout the pattern I have used the Easy Angle ruler. The same one used in the last mystery. Since I have this in my ruler collection I should use it – right? I have tried to give other ways to cut this out. But you may have more biased edges to deal with and possibly a little more trimming. Your choice! Okay, let’s build our garden…. Click Here to Continue to Second Clue!